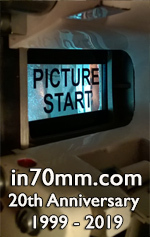 With the support and co-operation of Cinerama, Inc., radial camera #3 was re-activated to produce a 30 minute short subject: "In the Picture". 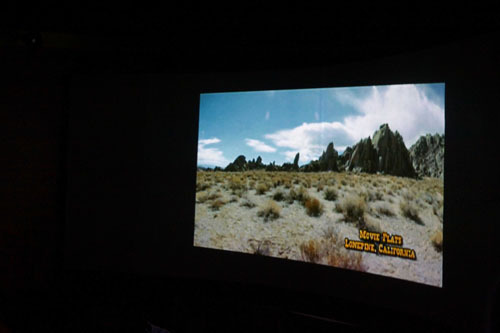 It was completed in time to 'World Premiere' during Cinerama's 60th Anniversary Festival held at Pacific's Hollywood Dome on Friday, September 28, 2012. Six months later Dave Strohmaier took the film over to the Bradford International Film Festival Widescreen Weekend, where it had its European Premiere on April 27, 2013. 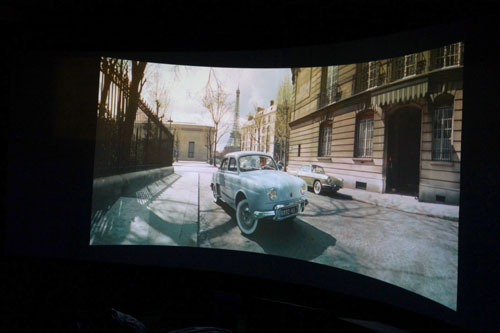 The evening started with David Strohmaier’s digital version of the Renault Dauphine commercial. Tom March is credited as Producer of this restoration. 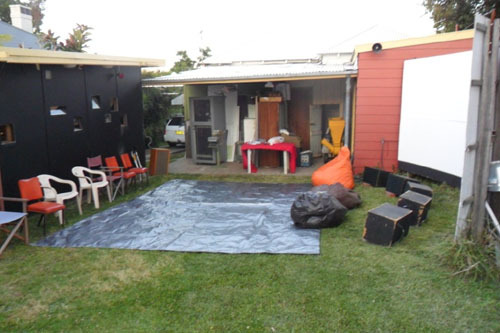 With Europe and the Americas covered, the only other continent with a venue able to present the 3-strip format was Australia. 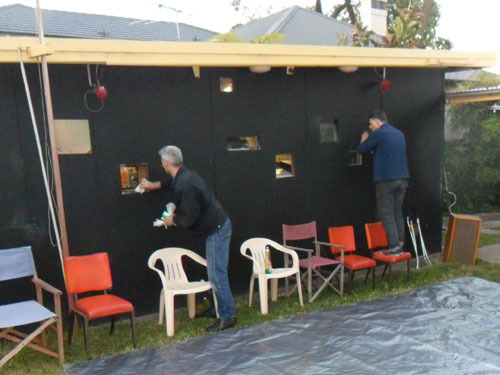 The Australasian Premiere of "In The Picture" took place on Friday, October 4, 2013 in the world's only open-air 3-strip theatre at the home of John H. Mitchell in Sydney. 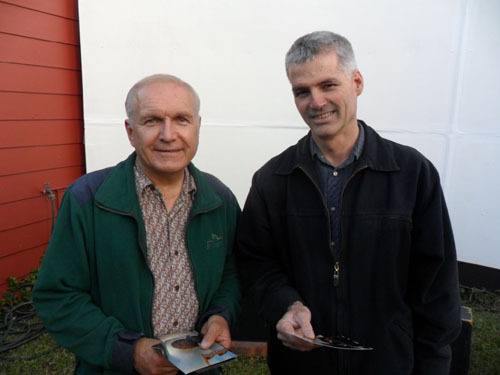 Dave Strohmaier was unable to attend the event, but a Canadian Cinerama Aficionado - "In The Picture" co-producer (and 'extra') Tom March was available, and keen to make the trip. Making his first visit Down Under, Tom spent a week in Sydney as house guest of David Coles - who lives within 'walking distance' of John's legendary venue. Tom had been looking forward to seeing this unique set-up, and meeting in person John H. Mitchell - the man who has been keeping the 3-strip flame alive Down Under for over 35 years. Then Tom learns the difference between a 'Middy' and a 'Schooner' ... [Beware of cultural differences: In the State of New South Wales a 285ml (10 fluid ounce) glass is called a 'middy' - but in Brisbane and Melbourne it is known as a 'pot'. 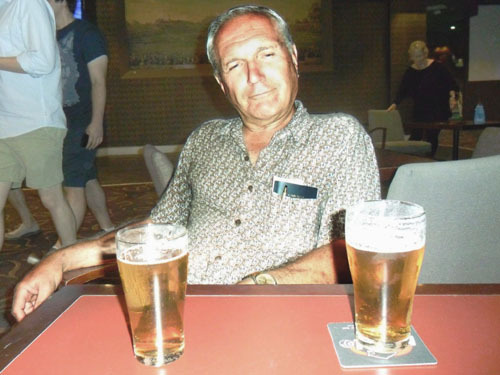 In Adelaide it is called a 'schooner' and elsewhere a 'half pint' or a 'ten'. The 425ml (15 fluid ounce) size - right in the picture - is a 'schooner' everywhere except Adelaide where it is called a 'pint'.] Confused? 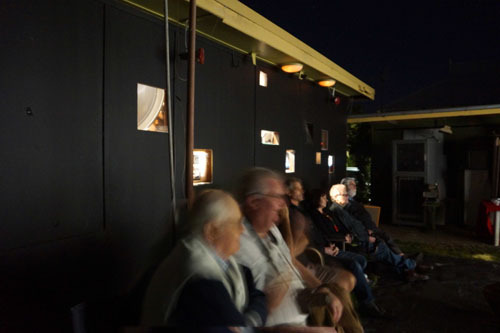 A two night 'Festival' was held, with "In The Picture" and a variety of video and 3-strip items shown on Friday evening, and a feature "The Best of Cinerama" (1962) being screened on the Saturday. 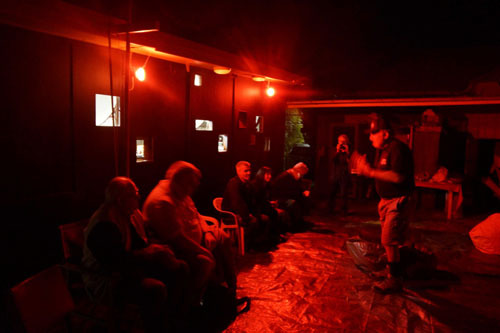 The nature of the venue meant that only a about a dozen invitees could be accommodated. 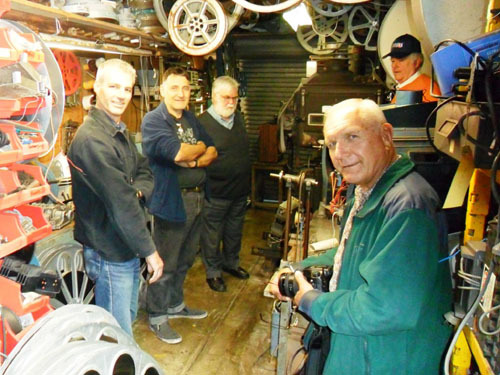 Tom was pleased to be re-acquainted with other Cinerama fans like David Coles and Eric White (a regular Bradford attendee from Melbourne). 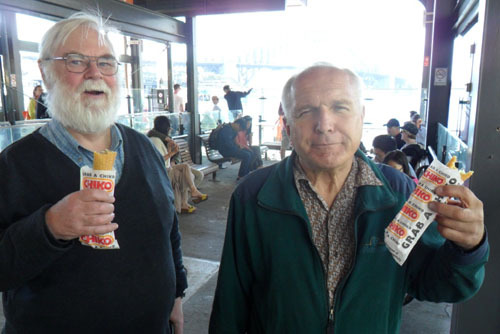 He was also delighted to meet other enthusiasts like Jorge Schneider, and Brian Walters - who had travelled down from Brisbane for the occasion. Two grand evenings were had by all. Everyone was especially grateful to John for making the effort to re-activate his equipment. (He had not run a screening there for nearly two years). 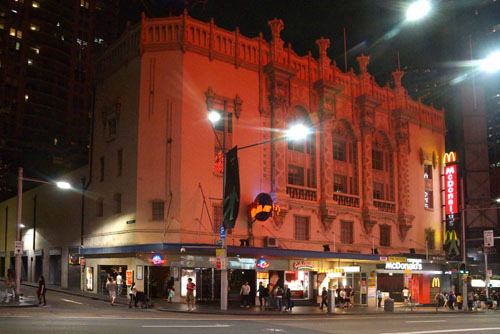 Along the way, our guide David Coles pointed out the few surviving old cinema buildings in the Sydney area, and many local landmarks. Here is a night shot of the old Plaza Cinerama Theatre building (now with a McDonalds in its foyer - Tom had a chocolate Shake). 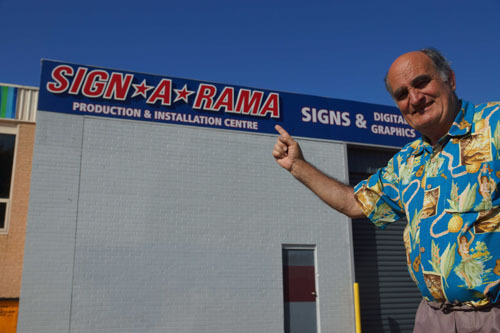 Here is one for the 'Rama' collection (Tom 'noticed' this). Main purpose of Tom's visit? 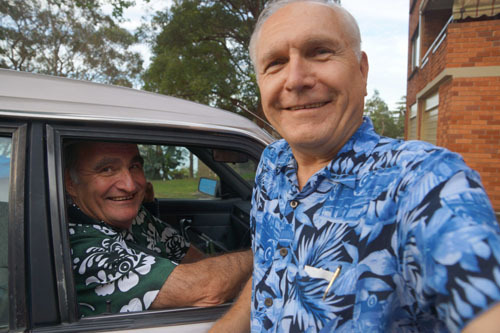 To attend the Australasian premiere of Dave Strohmaier's new 3-panel Cinerama short subject "In The Picture" - 6.30pm Friday October 4, 2013 at a strange locale. 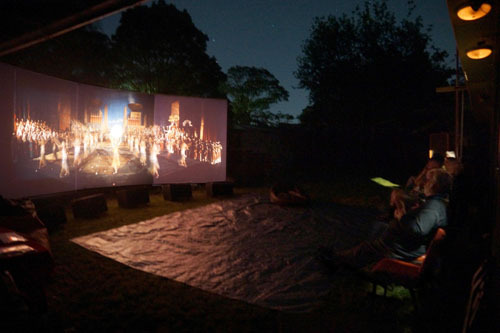 The 'giant' open air screen at John H. Mitchell's place, where he has a typical Sydney suburban backgarden - with a difference! 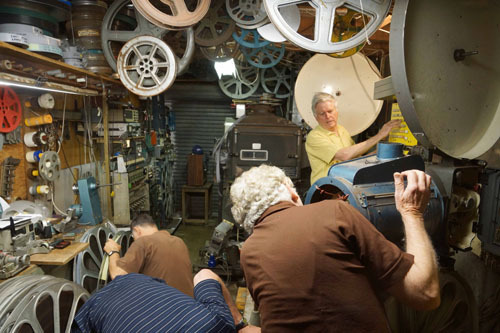 In the garage Projection Booth, John (Cinerama capped) and several of his visiting assistants (from Sydney, Melbourne, Brisbane and Calgary). 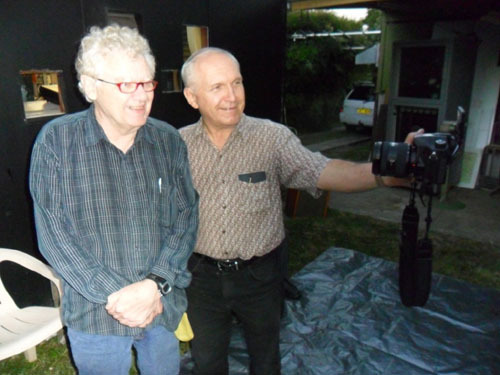 Tom with 70mm large format enthusiast down from Brisbane: Brian Walters. 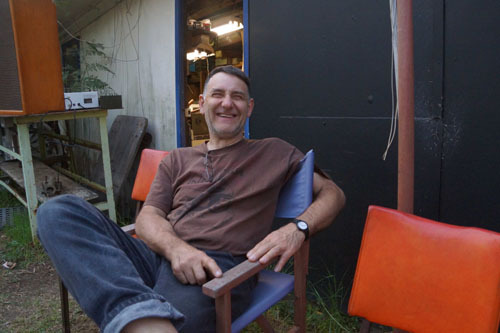 Charles Slater - all the way from Wollongong: 2 hours south of Sydney. 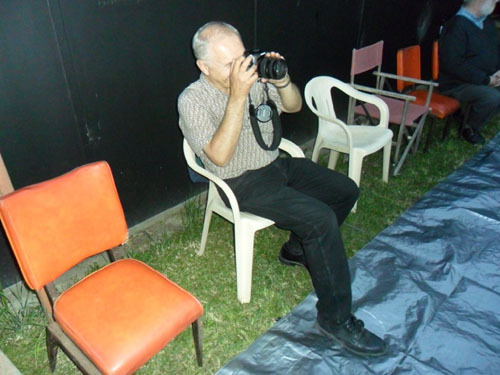 John Adey - editor of KINOCinemaQuarterly magazine was also in attendance, to report on the event. Eager assistant projectionists Brian and Jorge are put to work cleaning the 'ports'. Tom seated ready for the show, always with his camera at the ready. Inside, the preparations begin: John H. Mitchell and Jorge Schneider are winding “In the Picture”, the first 3-strip presentation on Friday’s schedule. After John and his technical crew have done all the hard preparation work, David Coles steps forward and introduces each on-screen presentation. The Renault commercial was followed by Dave Strohmaier’s "How The West Was Won - Location Video” featuring 'as they look today' photos which were taken by Tom March. 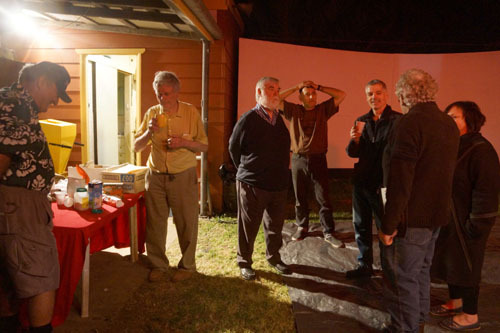 Then John H. Mitchell pressed the magic button, and we were treated to - believe it or not - Backyard 3-strip Cinerama. 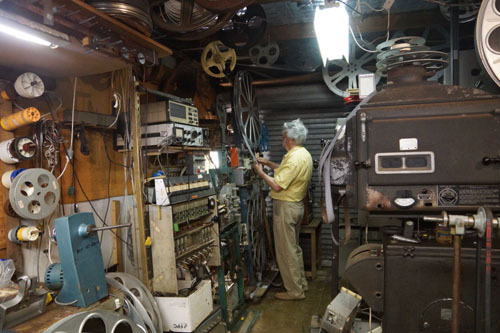 This is the 35th year that John has run Cinerama from his garage. 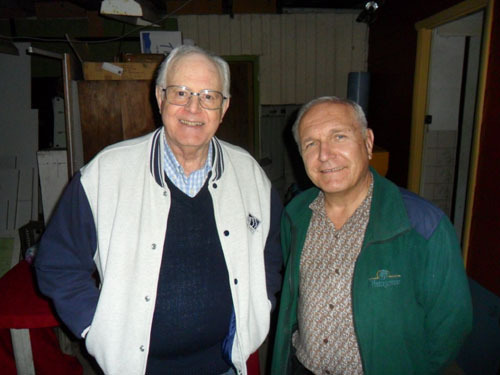 He started in the late 1970s - around the same time as John Harvey in Dayton commenced his home screenings. 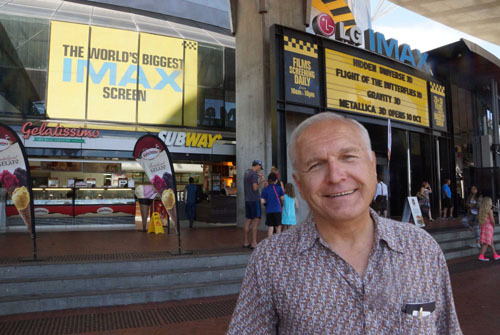 John’s 'work print' of “In The Picture” (a 30 minute 2012 attraction co-produced by Tom March) was being shown for the first time Down Under, and it looked mint. A big thank you to Dave Strohmaier, John Sittig and Cinerama, Inc. 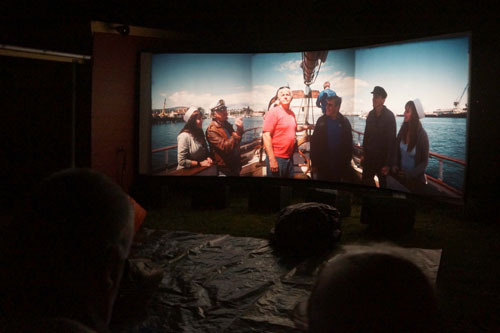 It was great Spring weather for a backyard Cinerama festival and "In The Picture" was enjoyed by all. Seated left to right: John Adey, Mark Love, Brian Walters, Lena Slater, Charles Slater, Eric White. 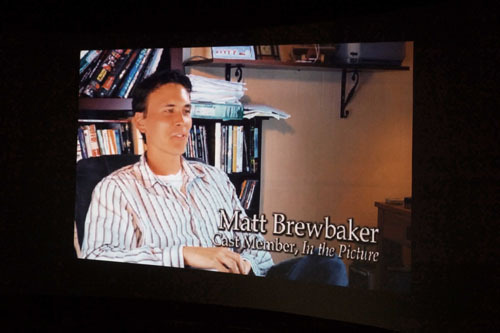 Next came "The Last Days of Cinerama", a documentary about the making of “In The Picture” by Mike Celestino and Robert Garren. 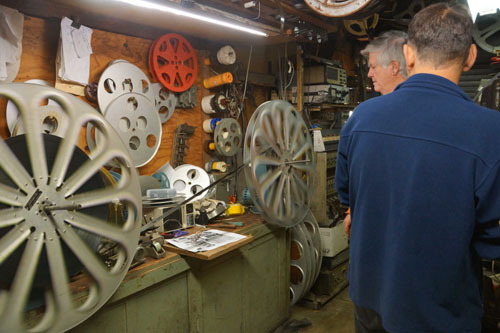 The video items provide time for reel changes and preparation of the Cinerama projectors for more 3-strip activity. 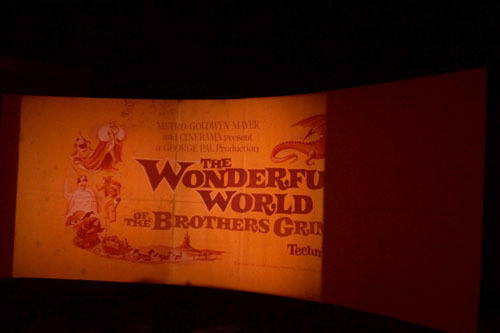 The next three strip Cinerama presentation included the Renault short and a "Brothers Grimm" trailer which ran partly in 2-panel due to a film break on Charlie projector. (And the Lowell Thomas breakdown reel hadn't been loaded). The Friday Night events wrapped up with an 'audience in front of screen' group photo (in Widescreen Weekend tradition). 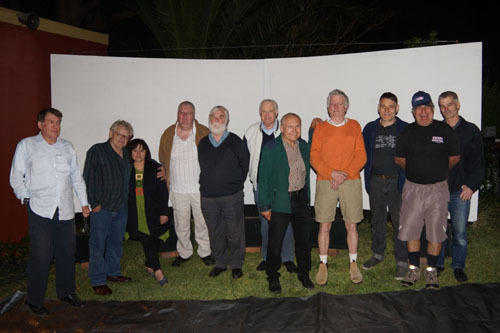 Left to Right: Nick Stewart, Charles Slater, Lena Slater, Mark Love, Eric White, John Adey, Tom March, John H. Mitchell, Jorge Schneider, David Coles, Brian Walters. 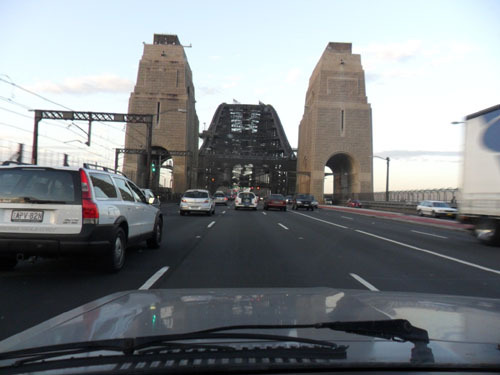 The next day: Leaving David Coles' place at Chiswick, heading to North Sydney for the Saturday evening Cinerama events. 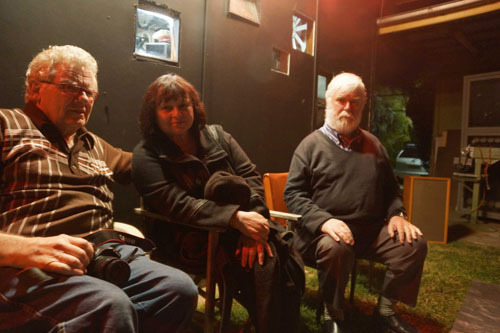 Some of those eager for more - returning on the Saturday night: Charles Slater, Lena Slater, Eric White. 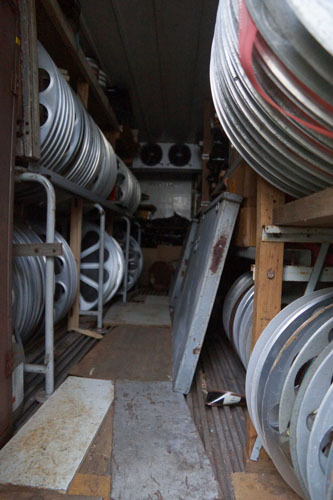 A peek inside John H. Mitchell’s refrigerated film vault located behind his garage. 'Spool Boy' Jorge Schneider relaxing before the big evening. The Right Surround Speaker can be seen in the background. 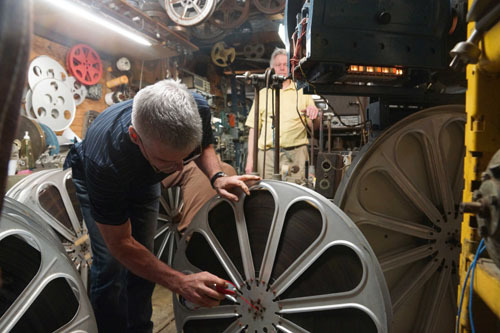 John H. Mitchell 'laces' up the all important sound reel - OOOPs make that 'threads' (that's the term used Down Under). Loading Able, Baker and Charlie. 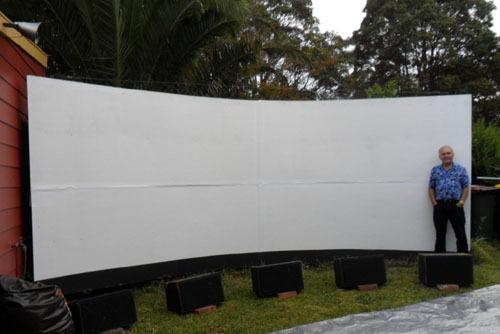 No need to adjust projector speeds - both nights attractions were designed for 26 frame per second presentation. A little rust treatment oil dabbed here, under the watchful eye of the Chief Console Operator. The feature event Saturday night is the only known surviving version of "The Best of Cinerama" (1962). 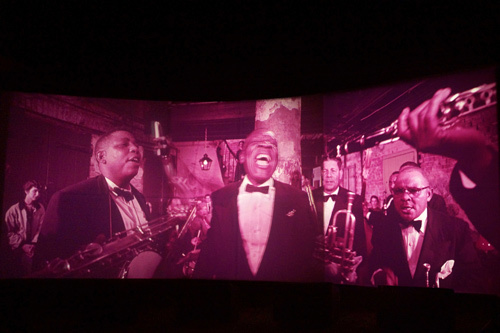 It includes Technicolor clips from "This is Cinerama". 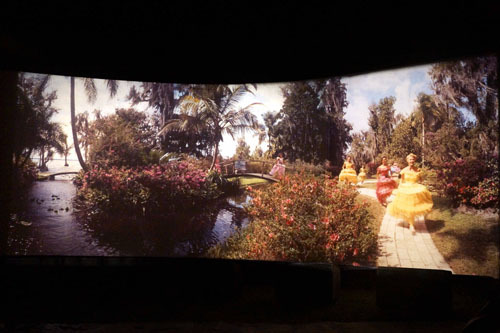 Cypress Gardens, Florida: The colors in the “dye transfer” Technicolor print look great. 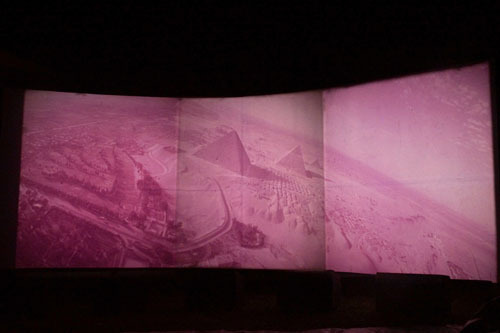 The "Cinerama Holiday" segment is Eastman color and has faded to magenta. 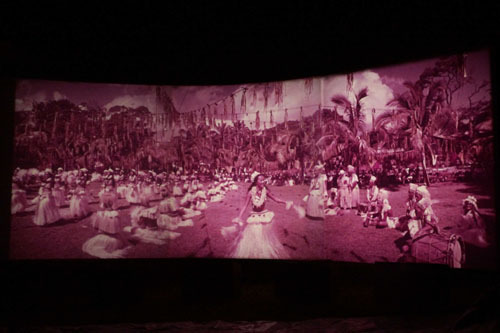 Likewise, "Cinerama South Seas Adventure" is Eastman color. Ramine (centre) looks good in pink. And the "Seven Wonders" clip looks clean but faded. (All release prints of "Best of" were created from 'vintage' picture elements cut from prints of the original five travel titles and edited together with a newly produced soundtrack). 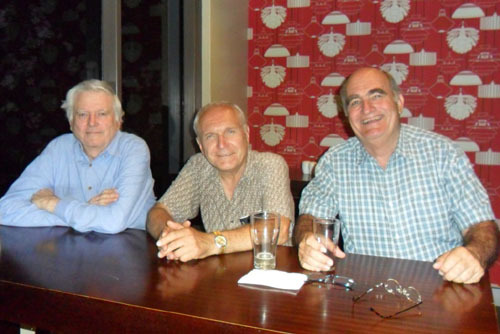 After the show, a little wrap party and lots of goodbyes - four of the attendees expect to next meet again in April 2014 at Bradford.